Counting of votes resumed on September 15 evening after it was suspended for nearly 14 hours following violence, allegedly unleashed by the ABVP. 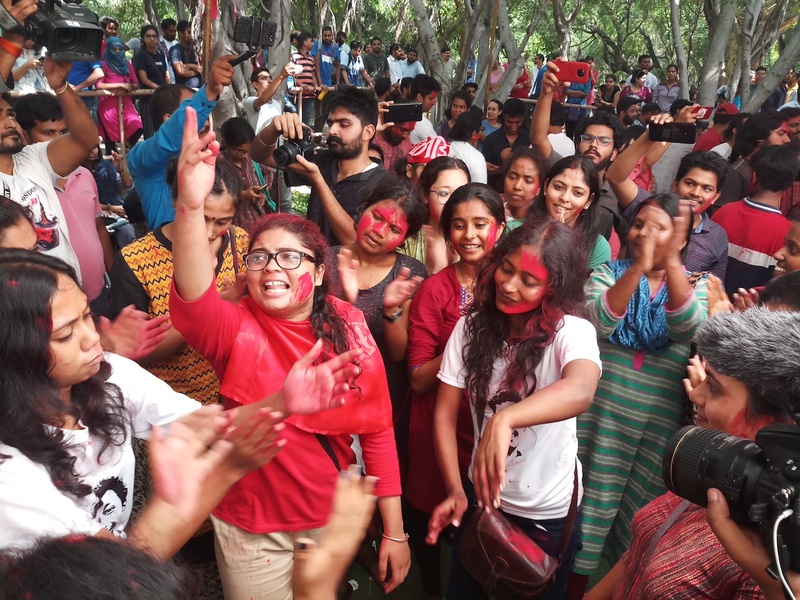 Despite strong opposition put up by the RSS-backed Akhil Bharatiya Vidyarthi Parishad (ABVP), Birsa Ambedkar Phule Students Association (BAPSA), the students’ wing of the Rashtriya Janata Dal (RJD), and several other independent candidates, the United Left registered a massive victory in the Jawaharlal Nehru University Students Union (JNUSU) elections on September 16. The Left unity (comprising the All India Students' Association or AISA, the Students' Federation of India or SFI, the All India Students' Federation or AISF and the Democratic Students' Front or DSF) has won all four key posts of president, vice president, general secretary and joint secretary. N Sai Balaji has been elected as the president, Sarika Chaudhary as the vice president, Aejaz Ahmed Rather as the general secretary and Amutha Jayadeep as the joint secretary. Counting of votes resumed on September 15 evening after it was suspended for nearly 14 hours following violence, allegedly unleashed by the ABVP. 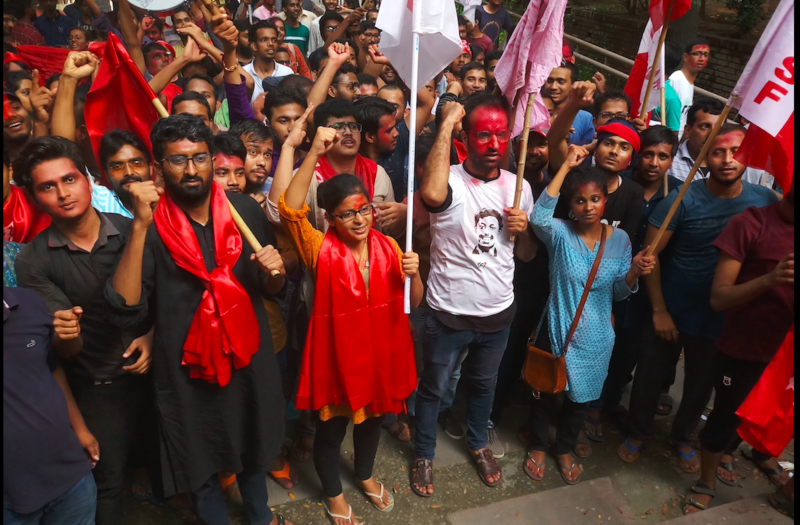 The ABVP supporters allegedly ransacked the School of International Studies building, where the ballot boxes were stored, and assaulted many student activists. Several students suffered injuries, while a couple of them suffered even fractures. The right wing group claimed that counting had started without informing them. But, the allegation was strongly denied by other students’ groups participating in the polls. They claimed that the Election Commission (EC) had invited them thrice, but none of their representative turned up. "The EC informs thrice to all the groups taking part in the elections to send their representatives to the counting centre. When any one of them fails to do so, the poll watchdog is mandated to go ahead with the counting process," many students told Newsclick. Following the drama on September 15 evening, two teachers – said officials – from the Grievance Redressal Cell were appointed as observers for the exercise. The voter turnout in the keenly contested JNUSU election on September 14 was 67.8 percent, believed to be the highest in six years. Over 5,000 students had cast their votes. Apart from top four posts, the Left unity also bagged 26 of the 29 counsellor posts in different schools. Rest three (one each) were won by the NSUI, the ABVP and the BAPSA. Soon after securing the victory, Sarika told Newsclick that it is a mandate against ABVP's "hooliganism" and the "oppressive" government of the day. "They tried every tactic right from freebies to violence, but JNU students trusted on us. We are thankful to them. This victory will impact the 2019 general elections, wherein the NDA government will face defeat," she added. "This time," she said, "record turnout took place. It happens when people want to kick someone out". But the ABVP claimed "moral victory" despite losing badly. "The Left contested in alliance and managed to win. We fought alone and even then emerged as the single largest party. It is not our defeat but a moral victory for us," said ABVP's presidential candidate Lalit Pandey. By getting 2,151 votes, Balaji of the Left Unity defeated Lalit – who secured 972 votes –by 1,179 votes. Sarika won the post of vice president by winning 2,592 votes. She defeated Geeta Sri of the ABVP who secured 1, 013 votes by 1, 579 votes. The post of joint secretary was grabbed by Amutha of the Left unity, who got 2,047 votes. Venkat Chaubey of the ABVP got second position by winning 1,290 votes. The victory margin on this post was of 757 votes. The JNUSU poll results came within days of the Delhi University Students Union (DUSU) elections, which were marred by allegations of cheating, after the Election Commission of India (ECI) never gave electronic voting machines (EVMs), several of which malfunctioned on counting day. The election panel's statement that the EVMs used in the DUSU polls were not issued by them came after some NSUI and ABVP supporters clashed at a counting centre in North Delhi's Model Town on Thursday. Counting was stopped for some time after several EVMs malfunctioned.